28 Mar Wool market bouncing along. One week down, the next week up. This has been a familiar pattern in recent times although this week the lift in the market was all due to currency movements. It was a tale of two markets, the opening day was where all the gains were made, with Thursday delivering a modest retracement. The Eastern Market Indicator (EMI) had picked up 27 cents to 1778 cents, ironically retrieving the same amount that was lost last week. In US$ terms the EMI actually lost 2 cents (Figure 1). The AU$ lost favour during the week, easing by 1.3 cents to $0.775, which accounted for all the increase in the general market indicators. The West also had a good result, the Western Market Indicator (WMI) gained more than last week’s loss seeing a 35-cent improvement to 1869 cents. The two-market story continued into the relative prices within micron categories; again, AWEX reported that better style wools, while in short supply, were keenly sought, conversely high mid-break wools were increasingly neglected and discounted. Crossbred types also recovered all last week’s losses, rising between 10 and 20 cents. 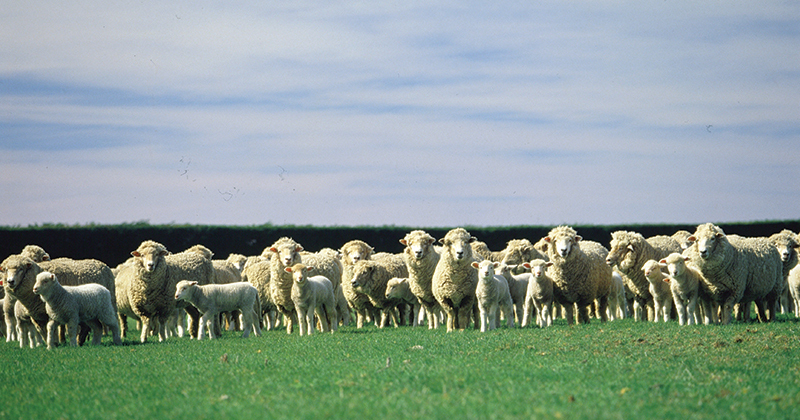 Merino skirtings followed the fleece types higher for the week and generally held the gains to the close. Merino Cardings also had a good week, posting around a 30-cent improvement. 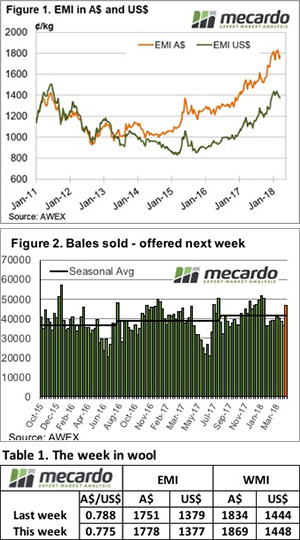 As has been the case in recent months, growers responded strategically to the better prices and only passed in 4.0%, down from last week’s 9%, resulting in a clearance to the trade of 36,707 bales. Next week there is almost an additional 10,000 rostered, with 47,091 bales forecast on offer across the three selling centres. Due to the Easter break, the two days of sale will be on Tuesday & Wednesday, with a one week break after Easter. On resumption, another 47,000 bales are offered, which will test the resilience of the market. AWEX report that volumes are predicted to decline after this sale.